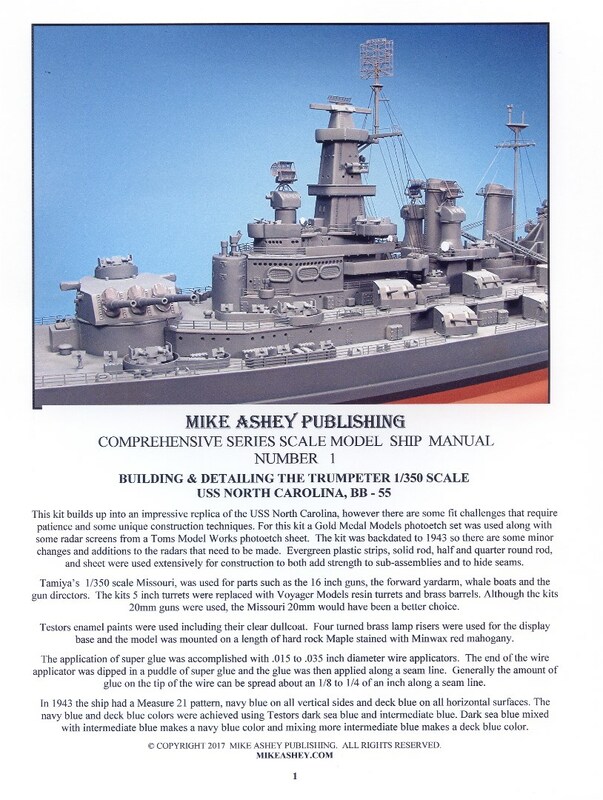 To purchase the Trumpeter 1/350 scale USS North Carolina scale model manual on printed paper click this PAYPAL button. To purchase the Trumpeter 1/350 scale USS North Carolina scale model manual PDF click this PAYPAL button. This comprehensive series manual shows you how to assemble this kit in the proper sequence and backdate it to 1943. Assembling Gold Medal Models brass photoetch, Voyager Models Resin twin 5”/38 gun mounts and radar photoetch from Toms Model Works for backdating the North Carolina are also presented in step by step sequenced color photos. The manual shows you how to modify and adjust parts for a better fit and how to deal with seams and imperfections in hard to reach places. The three piece deck has fit issues and the manual demonstrates how to solve the fit problems and rescribe the wood deck detail along the seam lines so that the seams disappear! Parts from other 1/350 scale kits such as the Tamiya USS Missouri are also integrated into the construction sequences to enhance the appearance of the finished model. A Step by step painting sequence for achieving a perfect measure 21 pattern is also provided.